Over 40 years ago, AQUA began as Spa and Sauna Trade Journal with the sole purpose of serving the burgeoning spa business that was emerging on the west coast. These products began gaining popularity and many pool stores across the country became a retail home for these products. 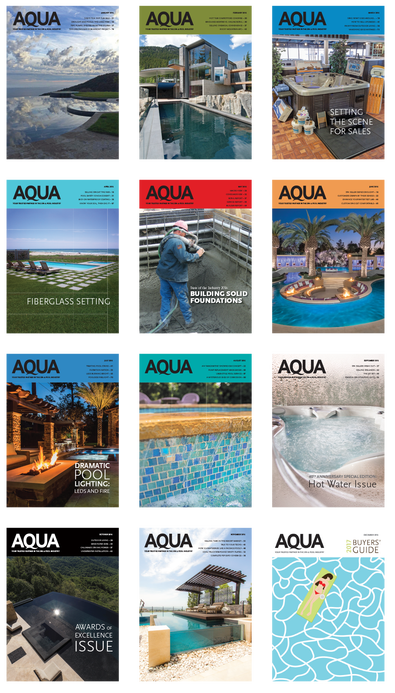 In response to the changing retail landscape, the publication changed its name to AQUA in order to serve a broader audience. Getting back to our roots, we started the annual "Hot Water" issue last year (check it out here). You'll find it covers a wide range of topics relevant to the spa industry and in reality, is the most in-depth coverage of the topic in a single issue ever produced anywhere. This September will be our second annual "Hot Water" issue and we plan to outdo our 2016 coverage. With the largest audited reach to the spa industry in North America and the producers of the most spa-related content of any other publication over the last 40 years, we're looking forward the challenge once again in 2017. Plus, with a 25% increase in Q1-Q2 web visits for 2017, you don't want to miss out on this great brand exposure opportunity! We share a roundup of 2017's new and bestselling portable spa models​. Contact your sales rep to learn how your company can be featured in this product roundup for free! A look at what's trending in today's hot tub showrooms. Builders and manufacturers share tips and tricks for drop-in spa installations. A look at how custom slides can be used creatively to add more thrill to the backyard. The pool/spa hybrid is growing in popularity, especially for consumers with small backyards. We review the history of the hot tub wellness movement. PLUS, bonus distribution at the Pool Industry Expo in Monterey, spreading your message to an even larger audience.